Want something to help relieve the foot pain you feel due to diabetes? You’ve come to the right place. The MagniLife Pain Relieving Foot Cream is what you need for a better life. Diabetes known as diabetes mellitus is a metabolic disease in which the patient has high blood glucose, either due to inadequate insulin production or due to the improper response of body cells to insulin, or both. Patients experience polyuria (frequent urination), polydipsia, and polyphagia (hungry) in diabetes. The common symptoms of diabetes are intense hunger and thirst, frequent urination, weight gain, fatigue, numbness and tingling in feet and hands. Moreover, cuts and wounds do not heal, or they take a lot of time. Diabetic patients with a high blood glucose level can have damaged nerves or blood vessels. Nerve damage results in losing feelings in the feet. It also results in deficiency of oxygen and blood supply to the feet, which makes it hard to heal from infection or sore. A diabetic foot exhibits pathology that directly results from diabetes mellitus. Diabetic foot syndrome exhibits diabetic foot pathologies like diabetic foot ulcer, infection and neuropathic osteoarthropathy. Diabetes results in peripheral nerve dysfunction which leads to reduced ability of feeling pain. Diabetic patients are at a risk of diabetic foot ulcer development. Peripheral nerve dysfunction along with peripheral artery diseases (PAD) cause low blood circulation to extremities. Wounds take a long time to heal, an infection might set in, and amputation becomes necessary. Foot infection is common because of non-traumatic amputation in diabetic patients. The peripheral nervous system connects the nerves from CNS to different body parts including skin, internal organs, hands, muscles, legs, feet, and face. Neuropathy is a painful condition caused due to damage to the peripheral nervous system. Neuropathy can affect sensory neurons responsible for pain, touch and heat sensations, motor nerves controlling movement or autonomic nerves controlling blood pressure, heart rate, digestion, and bladder functions. Diabetes: Diabetes is one of the leading contributing factors of neuropathy development, affecting over half of the diabetic patients. MagniLife cream can be described as an intense, moisturizing treatment product developed for treating severely dry, itchy, cracked, and painful skin on the feet. It helps in softening hard and callused skin and relieves painful fissures and cracks. This product is completely safe to apply between the toes. It has been formulated with fast-absorbing moisturizers and nourishing and healing ingredients. Furthermore, it works well for relieving foot pain due to diabetes. Active ingredients: Apismellifica 3X HPUS, Gnaphalium 6X HPUS, Gelsemiumsempervirens 6X HPUS. Inactive ingredients: Methyl Salicylate, water, beeswax, canola oil, octyl stearate, tocopherol acetate (vitamin E), Eucalyptus Oil, Bergamot Oil, Camphor, Menthol, Steareth-10, Steareth-21, Cetyl Alcohol, Glyceryl Stearate, Ceteth-20, Stearic Acid, Xanthan Gum, Carbomer 940, Methyl Paraben, Propyl Paraben, Propylene Glycol. Sufficiently apply and massage to all surfaces of the heels, feet, and toes twice a day. MagniLife DB Pain Relieving Foot Cream is an ideal option for both men and women who have diabetes. Although the foot cream is not formulated in relieving foot pain, yet the ingredients facilitate substantial relief. The three vital, active ingredients are homeopathic components known as ApisMellifica, Gelsemiumsempervirens along with Gnaphalium. ApisMellifica is extracted from honey bees and is used to treat swelling and to alleviate nerve pain. This component is usually found in treatment products for multiple sclerosis and various diabetes programs. Apis acts particularly on the outer parts, inner organs coating, skin, and serous membranes. It effectively reduces inflammation and swelling. This ingredient is safe for all age groups. Gelsemium, often known as woodbine, is used for relieving pain. It also works for asthma patients as well as people with other breathing problems. It acts on the brain to alleviate pain. Gnaphalium also acts to reduce nerve pain. In fact, due to its effectiveness, it is a recommended therapy for patients experiencing debilitating pain due to sciatica. The other ingredients that have an effect to fight pain are methyl Salicylate, eucalyptus oil, bergamot oil, camphor, and menthol. Methyl Salicylate known as wintergreen oil is produced by many plant species especially wintergreens. It acts as a rubefacient and an analgesic in treating muscular and joint pain. It acts as a counter-irritant and metabolizes into salicylic acid which is NSAID. It alleviates mild to moderate pain and musculoskeletal pain by increasing blood flow via capillaries dilation. Eucalyptus oil is an antimicrobial, antibacterial, antiseptic, and anti-inflammatory oil. It relieves muscle spasms, alleviates pain and inflammation and provides antioxidant protection. Bergamot oil provides a relaxing aroma and relieves tension in the muscles. Methanol and camphor provide fresh and calming aroma. Another beneficial quality and feature of this foot cream is that it moisturizes the skin. Various other foot creams are greasy in nature and rich in mineral oils which damage the skin. This foot cream is composed of ingredients that are effective and healthy, particularly for a diabetic skin and body. As diabetic feet lose some sensation with the passage of time due to neuropathy, it imparts a non-greasy feeling while lowering risk falling and slipping in diabetic neuropathic patients. MagniLife’s foot cream absorbs into the skin quickly and does not leave any greasy residue. This foot cream is antibacterial as well as antifungal which diminishes the risk of fungus development between the toes. The enriched, homeopathic formulation is a great product that can be soothingly directed over the feet. For diabetic patients, the added massage feature helps to alleviate pain and stress and provides soothing relaxation too. Diabetic patients also need to be concerned about the dryness of the skin of the feet. When the skin gets dry, it forms cracks which can become infected. A well-formulated foot cream, such as MagniLife Pain Relieving Foot Cream, not only alleviates pain but also helps in moisturizing dry feet and reduces the chances of infection. The ingredients such as canola oil along with beeswax help to reduce dryness as well as fill in cracks. Beeswax has anti-inflammatory effects. It is directed to use MagniLife’s foot cream on a regular basis, and it can be effective to wear socks, especially socks with silicone bottoms. Wearing socks adds more time to absorb moisture. It further soothes dry and cracked heels as well. 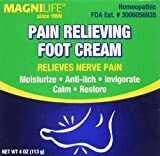 MagniLife Pain Relieving Foot Cream is available in a four-ounce container. The manufacturer recommends twice a day application of foot cream. It is directed to apply on the feet, toes, and heels with a proper massage which further enhances its effectiveness. A massage provides beneficial effects by reducing the pain efficiently. The product is safe to use on legs as well. While the MagniLife foot cream can help diabetic patients to relieve foot pain, it does not cure diabetes or foot pain. It is strong enough that people who are suffering from stabbing pain that hurdles them from walking can get instant relief. If your doctor allows, you can also cut down on pain-relieving medication if this cream is able to help you deal with the pain. Due to ingredients such as eucalyptus oil, methanol, and camphor, it has a fragrant, soothing and strong aroma. This is actually a natural smell and not any synthetic fragrance. This soothing aroma is beneficial because it creates brain harmony and provides relaxation. Overall, theMagniLife foot cream is one of the best available formulations for dealing with foot pain. The cream effectively helps people who have diabetes and diabetic neuropathy to continue their normal routine life where they are able to walk easily with reduced pain or even no pain at all. This product is safe to use. It is free from harmful side effects or adverse effects on the person’s health. It is a dual feature product which not only alleviates pain but also provides moisture to the feet and heels. This factor provides additional benefits to a diabetic foot by reducing the foot’s dryness and filling in the cracks as dry feet present a potential risk in diabetic patients. The antimicrobial effect of cream eliminates the chances of any kind of infection and further enhances its safety. It is an all-in-one product, not only for the diabetic foot but also for others suffering from pain due to other causes such as arthritis, etc. The anti-inflammatory feature relieves any swelling along with pain. So it might be time to try the MagniLife DB pain relieving foot cream if you are suffering from diabetic neuropathy.